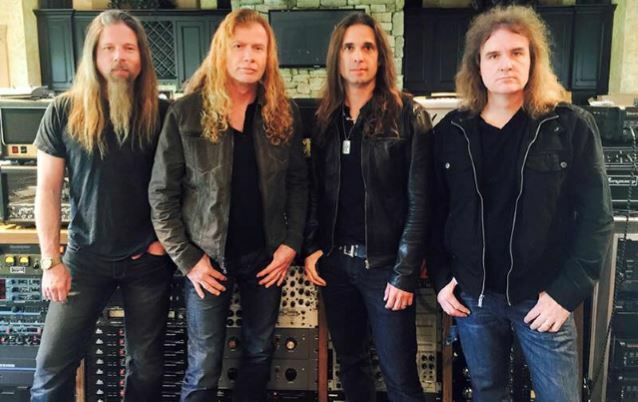 The first photo of the recording lineup for MEGADETH's fifteenth album — Dave Mustaine (guitar, vocals), David Ellefson (bass), Kiko Loureiro (guitar) and Chris Adler (drums) — can be seen on this page. MEGADETH has entered Lattitude Studio South in Leiper's Fork, Tennessee to begin recording its new CD and the group wants to bring its fans along for the ride. For the first time, MEGADETH is going to bring you into the studio to be a part of the recording process, and give you a window into the world of Mustaine, Loureiro, Ellefson and Adler. 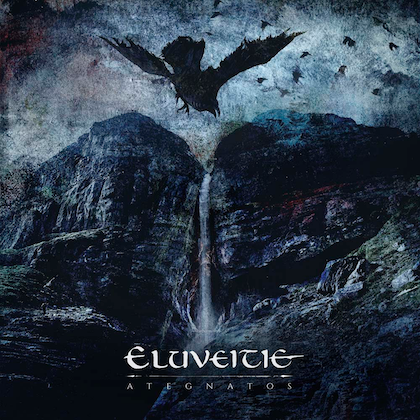 Some of the exclusive items available when you pledge via PledgeMusic are a pre-order the album digitally, on CD or vinyl, a signed copy of Dave Mustaine's book, a signed copy of David Ellefson's book, a two-hour guitar lesson with Dave Mustaine, a day in the studio with MEGADETH, signed guitars, Chris Adler's drum kit, a disposable camera with one-of-a-kind photos from the studio, a jam session with the band and much more. No matter what you order, you will get access to a variety of behind-the-scenes content such as photos and videos from the writing and recording sessions. You'll get full access to the process in real time. Mustaine's message to MEGADETH fans about the campaign: "We've always wanted you to be 'a part of' and not 'apart from' us in the studio. Now, with PledgeMusic, you can be here with me and the guys and watch history being made with our fifteenth record. Check back often... you don't want to miss anything!" MEGADETH announced on April 2 that Loureiro had joined the Dave Mustaine-led group as the replacement for Chris Broderick. Mustaine said in a statement: "I first met Kiko around eight years ago for a cover shoot for Burrn! magazine. I had no idea who he was, other than the fact he was tremendously talented and that the staff from Burrn! held him in high regard. Since then, I've come to see what a guitar virtuoso he is, and I'm deeply encouraged by his depth and talent." He continued: "Very few MEGADETH alumni have had the same feel and ability as Kiko." In a separate statement, Mustaine called Adler "a tremendous talent" and "an amazing person" who is "going to bring a new level of excitement and energy to MEGADETH that the fans are going to lose their minds over." Adler was equally excited about playing with MEGADETH, saying: "I'm coming into this on fire. There is an incredible amount of respect, but the goal here is to make the very best thrash album we can — not just throw names in the CD booklet or be a 'yes' man. Together, I believe we can do something very special."